With medical technology getting more advanced, healthcare facilities see no end to their exponential growth in size and capacity. While largely overlooked, the key to hospitals performing with quality care and professionalism is the rigorous behind-the-scenes work of their medical staff services department (MSSD). Yet with extensive regulatory process changes, MSSDs struggle to juggle larger objectives that improve bottom lines. 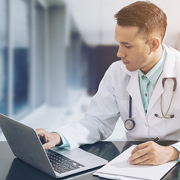 Because physician credentialing is critical to hospitals' uninterrupted operations, forward-thinking hospitals outsource physician credentialing to a reliable and professional physician credentialing service provider. Outsource2india (O2I) has over 20 years of physician credentialing service experience and provide services that will ensure quality while minimizing costs. O2I's medical credentialing services focuses on intensive research, fast approvals, and regulatory compliance. Our established relationships with insurance companies and streamlined credentialing services cuts costs but retains quality professionals for our clients. Instead of draining resources from other administrative functions and diverting experienced hospital staff toward purposes of physician credentialing, outsourcing physician credentialing to O2I frees your resources to invest in future business development. O2I is well serviced to expedite the physician credentialing process to match your growth potential. We examine items such as individual's license, education, experience, training, residency, training, as well as any specialty certificates in order to determine if a physician meets the standards set by the Payer. We collaborate with medical providers nationwide in all specialties which allows us to credential professionals with HMSs, PPOs, EPOs, POS, HDHPs or any other health plan. We have expert credential professonals who will prepare, assemble and supervise the credentialing applications to secure a consistently smooth and swift process. O2I has a team of medical credentialing experts who decide when referrals require authorization and follow the imperative steps to obtain them through the Payer's specific stipulations. Depending on the payer's or insurer's terms, we remain organized in setting up the appropriate documentation for smooth applications. Partnering with NCQA's Credentials Verification Organization (CVO) ensures tried and true operations, processes, and continual improvements to the credentualing process. Our specialists are well informed on when re-application is necessary which can save hospitals from extraneous expenditure of costs, time, and resources. Why Choose O2I for Physician Credentialing Outsourcing? Data Security - We hold fast to the commitment to carefully handle all sensitive health information without risk to security breaches. Our specialists abide by NDA and SLA standards to assure reliable and trustworthy practices. Accuracy and Quality - Taking all requisite steps secures the delivery of exhaustive and error-free physician reviewing. Lower Labor costs - Rather than in-house departments having to divide their energies with handling insurance enrollment, credentialing, and other responsibilities of their department, save labor costs by outsourcing such important processes to O2I. Read more about our Enrollment and Credentialing Services. Sophisticated Infrastructure - Our advanced and well-supported infrastructure handles large client data volume without complications. Combined with our security measures, our infrastructure is designed to keep your data well-maintained and away from manipulation. Industry Compliance - We are an ISO certified organization and all our healthcare support offerings are HIPAA, RBMA, CPT Coding, HL7, and ICD compliant. Faster Turnaround Time - As one of the leading physician credentialing servicing companies, we prioritize the success and efficiency of our work. Our established relationships with payers allow results to arrive sooner and smoother. Credentialing Software - With technology a key component of our credentialing process, we cut down waiting times and provide flexible system generated work lists and follow up capabilities, quality assurance mechanisms and KPIs. Our software tools adapt to the demands of your company and therefore administer smart credentialing services. Experienced Team - Our team of credential specialists work according to the standards fixed by states, regulatory bodies and accrediting organizations and rely on credible sources (National Practitioner Data Bank). This team brings a wealth of experience and resources to the credentialing process. Avoid Risk of Turnover - Our specialists are accountable in every step of the credentialing process. We keep records necessary during the entire process to allow uninterrupted input from our team of specialists. 24/7 Availability - As your partner, we prioritize your timeline and will connect you with our subject matter experts regarding any subject matter anytime, anywhere. We make it easy for you to come to us with any information, inquiry, or elucidation that is needed. We recognize your hospital's need for quality professionals in every capacity. It is because we leverage the best technology and industry knowledge towards your broader business goals that outsourcing physician credentialing services in India becomes a strategic asset. If you need assistance in growing your hospital with a team of qualified and accomplished physicians while keeping operational costs low, it is time to outsource physician credentialing to Outsource2india. Contact us today to learn more about our dependable outsource physician credentialing services that will take care of all your expansion needs!